A New and Accurate Map of Germany Divided into its Circles. 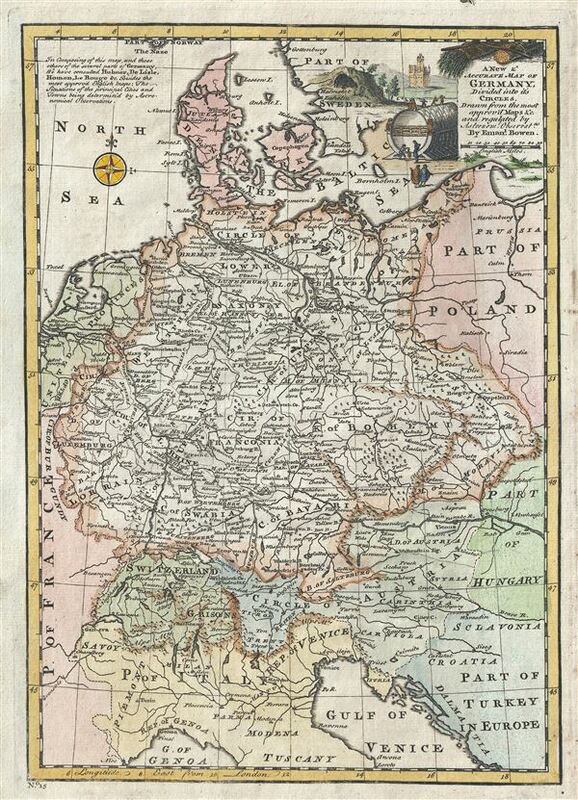 This is a beautiful 1747 map of Germany by the British cartographer Emanuel Bowen. It covers Germany during the mid-18th century, which included all of modern day Germany, Austria, Switzerland, Czech Republic, the Netherlands, Denmark and parts of Eastern Europe. Parts of northern Italy, Poland and Hungary are also included. The map divides the area into the 'imperial circles,' devised by the Holy Roman Empire. The 'imperial circles,' covering most of what is now Central Europe, were administrative units created for tax and defense purposes by the Holy Roman Empire in the 1500s. The Napoleonic Wars would, of course, dissolve the Holy Roman Empire and lead to the consolidation of Germany in 1871. Throughout, several towns, cities, rivers, lakes, roads and a host of additional topographical features are noted, with mountains beautifully rendered in profile. A beautiful title cartouche is included in the top right quadrant. Bowen notes that this map was based on earlier maps by Hubner, Delisile, Homann and Le Rouge. Prepared by Emanuel Bowen as plate no. 15 for the 1747 issue of A Complete System of Geography. Rumsey 3733.014. Philips (atlases) 614 (1752 edition).